Eisenstein commented on Disney: “Walt Disney’s work is the most omni-appealing I’ve ever met. (…) The very idea, if you will, of an animated cartoon [animation: literally, a drawing brought to life] is practically a direct manifestation of the method of animism. In this way, what Disney does is connected with one of the deepest features of the early human psyche.” His essay on Walt Disney was part of his unfinished book METHOD, a study of the relationship between archaic thought and art practice. 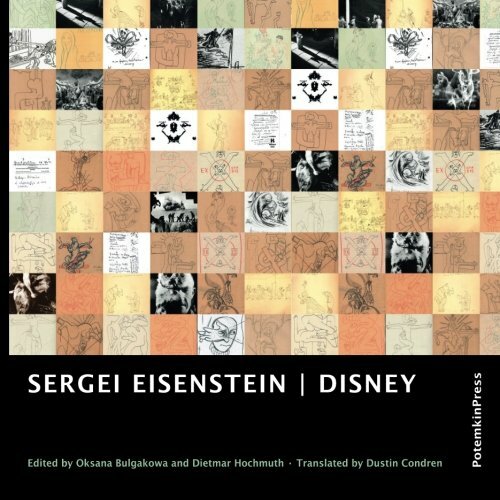 Disney becomes the central subject of analysis, because in his work the synesthetic affects of sound and color, and the perfect visual rhythm unite with animism, totemism and the plasmatic qualities of form. Eisenstein discovered in these distinctive characteristics of form a long genealogical ancestry and a deep yearning for the freedom that could allow one to imagine and even represent differently the relations of man and nature. “The rejection of the constraint of form, fixed once and for all, freedom from ossification, an ability to take on any form dynamically. An ability which I would call ‘plasmaticity,’ for here a being, represented in a drawing, a being of a given form, a being that has achieved a particular appearance, behaves itself like primordial protoplasm, not yet having a stable form, but capable of taking on any and all forms of animal life on the ladder of evolution.” The text exists on the border of collage, between a workbook and an intimate diary with the autobiographical, therapeutic passages on relationships to women and men, animals and plants on the sexualized relationship to reading and writing: “As usual. As soon as I read something new, breathless with delight, when it turns out that it fits perfectly somewhere into my research material. It’s understandable. The things that are thrilling for me tend to be of a particular nature. And they are also the ones that interest me from a research perspective. It’s pleasant, however, that this kind of stuff usually comes to me “par l’amour” [through love]. That gives it a certain suavity, vigor, emphasis instead of academic dryness. Something youthful, not to say boyish!“ Circus, ornament, cave paintings and Leonardo, Wilhelm Busch, Utagawa Toyohiro, Grandville, Saul Steinberg, Shakespeare, Balzac, Dostoevsky, Napoleon, Gorki, La Fontaine, Lautréamont, Hegel, Darwin, Freud und Ferensci, Fourier and Disney. Hardly anyone had heretofore attempted to place the work of the creator of Mickey Mouse within such an opulent context of high culture.